Tension test is performed on mild steel, tor steel and high tensile steel to determine the properties like Young’s modulus, ultimate strength, and the percentage elongation. 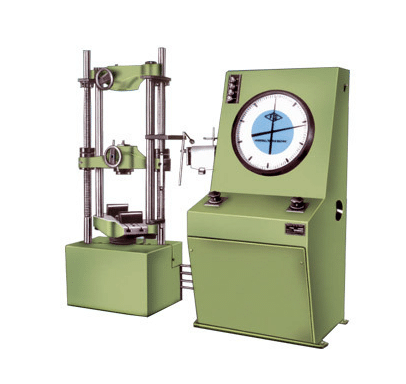 In the tension test, a steel rod is subjected to tension load by the means of a Universal testing machine(UTM). The equipment arrangement and procedure for conducting the tension test on steel rod are explained in this article in detail. UTM comprises two main units, one is the loading unit and other is the control panel. Loading unit: The loading of the specimen is conducted in the loading unit. In the figure above, the equipment in the left is called as the loading unit. The loading unit consists of three crossheads, they are the upper head, middle head, and lower head. These crossheads are used depending on the type of load(tensile, compressive or shear) applied on the specimen. When undergoing the tensile test, the upper and lower crossheads are used. Control Panel: This unit facilitates the load application on the specimen. The load application is performed by the action of hydraulic pressure. A pendulum dynamometer is fitted to measure and indicate the force coming on the specimen. A big size load indicating dial fitted with a glass cover is mounted at the side of the control panel. The range indicating dial is to be adjusted for the particular range selected. The specimen is subjected to constant tension load and the extension caused in the steel rod is noted against the load within the elastic limit. The load values at yield point, breaking point, and ultimate point are carefully noted.
. The gauge length can be marked on the specimen by punching tool. Range Calculation: A tensile stress value is assumed for which the maximum expected load capacity of the rod is calculated. From this, the range is calculated and this range is set in the UTM. Factor of safety = 3.
i.e Ultimate stress = 140×3 = 420N/mm². Ultimate load = 420 x area of c\s. From the ultimate load, range to be used can be fixed. Placing the Specimen: The handle is operated such that the specimen firmly fits to the top base. The left valve is kept in a fully closed position and the right valve in a normal open position. Open the right valve and close it after the lower table is slightly lifted. Adjust the load pointer to zero with the zero adjusting knobs. By operating the handle, lift the lower crosshead chuck up and grip firmly the lower part of the specimen. Once the specimen is placed, the jaws are locked. Placing Extensometer: Fix the extensometer on the specimen and set the reading to zero. Load Application: Turn the right control valve slowly to open position to get the desired loading rate. When the specimen is under load, slowly unclamp the locking handle. Note the extension at a convenient load increment. Extensometer must be removed before reaching the yield point. The right valve is used to apply the load and the left valve is used to release the load on the specimen. Important Load Points: With the increase in load at some point, the load pointer remains stationary. Load corresponding to this indicates the yield point. With further increase in load, the pointer goes backward and specimen breaks. The load before this breaking is the ultimate load. The load at the breaking of the specimen is called as the breaking load. As shown in figure-4 below, once the load crosses the ultimate stress (ultimate load) necking starts to form in the steel rod. Necking is a large reduction caused in the cross-sectional area of the steel rod. Close the right control valve and take out the broken piece. Open the left control valve to pump the oil back. Maximum capacity of the specimen can be seen against the red pointer. Measure the diameter of the specimen at the neck. With different values of stress and corresponding strains, the stress-strain graph is plotted. Viva Questions – Do you know? 1. Why is the testing machine called the Universal Testing Machine? 2. What is the maximum capacity of UTM in the laboratory? 3. What are the possible ranges in the UTM and what is the corresponding least count? 4. How do you change the loading capacity of the UTM? 5. How do you grip the specimen for tension test? 6. How do you find to set the load pointer to zero in UTM? 7. What is the use of a dummy pointer? 8. 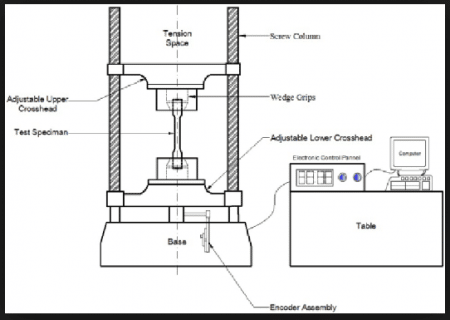 What is the name of the device used for measuring the elongation of the specimen in tension test? 9. What is the gauge length? Explain its importance. 10. What is the gauge length used for tension test? 11. Before you mount a specimen on the testing machine for any test, what are the preliminaries you must complete? 12. Identify the moving crosshead in UTM? 13. Explain the terms ductility and brittleness. Give an example. 14. Differentiate between elastic limit and yield point. 15. Differentiate between the elastic limit and proportional limit? 16. What is the purpose of calculating percentage elongation and percentage reduction in area in tension test? 17. What is meant by an isotropic material? 18. When is the neck formed in tension test? 19. Why breaking load is less than the maximum load? 20. What is the true stress-strain curve? 21. 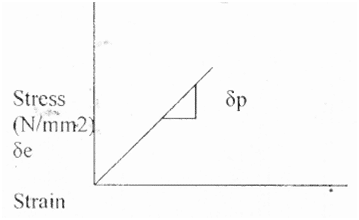 How do you find the area of cross-section of the deformed bar?